The oldest Jewish congregation in Southern California will host a community vigil Monday night in the wake of Saturday’s attack on a Pittsburgh synagogue that left 11 dead. 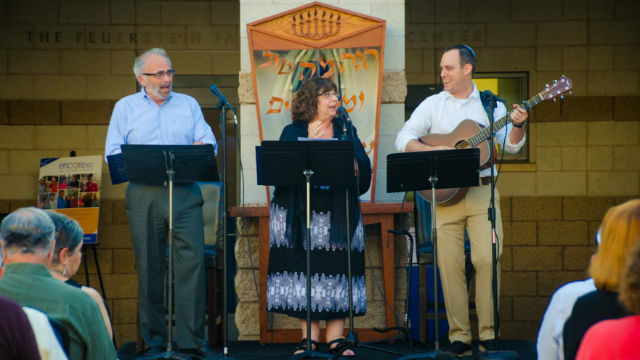 The event at Congregation Beth Israel is being organized by the local chapter of the ADL in partnership with the Jewish Community Foundation San Diego, Jewish Family Service of San Diego, the Jewish Federation of San Diego County, the Lawrence Family Jewish Community Center, the Leichtag Foundation, and the San Diego Rabbinical Association. “Now, more than ever, we must stand together as a community in this moment to denounce anti-Semitism and hate in all of its forms,” said a letter to members of Beth Israel, which was founded in 1861. The “Standing Together Against Hate” vigil honoring the lives taken at Tree of Life synagogue is set for 7 p.m. at Beth Israel, 9001 Towne Centre Drive in University City. The ADL said that the “unthinkable” had happened in the American Jewish community. “It is simply unconscionable for Jews to be targeted during worship on a Sabbath morning, and unthinkable that it would happen in the United States of America in this day and age,” said national ADL CEO Jonathan Greenblatt. On Saturday, prominent San Diegans including Mayor Kevin Faulconer and state Sen. Pro Tem Toni Atkins reacted on social media. The attack on a house of worship in Pittsburgh was a horrific act. We must stand together as a nation and declare that anti-semitism and any other form of hate is un-American and unacceptable. San Diego stands with our brothers and sisters in Pittsburgh. Our hearts are broken over the cowardly and hateful attack on the Tree of Life Synagogue In Pittsburgh. @SanDiegoDDAs mobilized our specialized Hate Crimes team working with our law enforcement partners, Anti-Defamation League and synagogues to protect and prevent harm in SD. My heart breaks for the families of the victims at the Tree of Life Synagogue, as well as the survivors coping with the trauma. My heart hurts for all who have lost their way in this world and have succumbed to anger and hate. We must show every day that there is a better way. I am horrified by the heinous attack on the Tree of Life synagogue in Pittsburgh. Words cannot express the anguish and heartbreak that I feel for the families of those injured and killed at the Tree of Life Synagogue in my home state. If you feel need to have an assault weapon, ⁦@USMC⁩ has recruiting offices in most every city-feel free to join. They have no place in our communities.